This dish is awesome because you can make it with whatever vegetables you have in your fridge or pantry. The ingredients I used I happened to have on hand the night I created the dish, but you can get creative with what you have in your kitchen tonight. 1) In large saucepan on medium high heat, add ½ of oil and onion. Saute about 5 minutes. Add bell pepper and sauté a few more minutes. Add all spices except fresh basil. Add diced garlic. 2) Add remaining ingredients except fresh basil and spinach. Bring to boil and immediately reduce heat to a simmer. Simmer while pasta cooks (choose your favorite pasta). 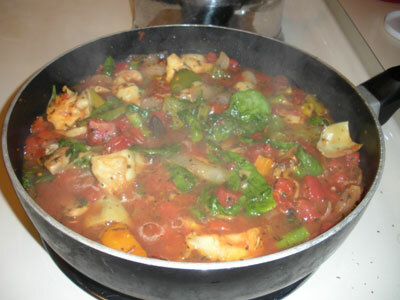 3) Add spinach and fresh basil and simmer a minute or two more. 4) Serve with your favorite pasta (I used angel hair for this dish). 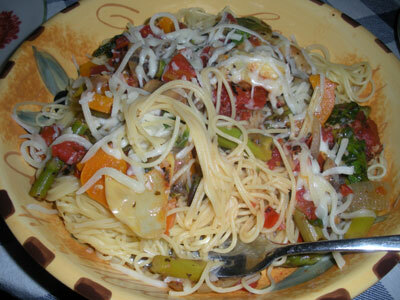 Top with grated low-fat, shredded mozzarella or other Italian cheese, if desired. Serves 2 with possible leftovers.